The garda was arrested on 2 April. 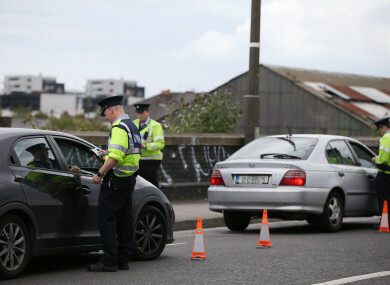 A SERVING GARDA has been arrested on suspicion of drink driving after a colleague pulled him over due to his erratic driving and defective vehicle, TheJournal.ie has learned. The member, who has not yet been disciplined by his superiors, is back working at a garda station in Galway. The garda is also back performing regular duties from a squad car. It is not known if he is driving the vehicle. On 2 April at around 2pm, the garda was observed driving his private car erratically. Not only was he driving in a dangerous fashion, the car also had a burst tyre, leading to him being pulled over. The arresting garda judged the man to be in an intoxicated state and ordered him to perform a breath test. As he was unable to do so, he was arrested and brought back to a garda station where a sample of blood was taken. Members in the district where the officer works have voiced concerns over his actions and also fear for his well-being. TheJournal.ie sought comment from the Garda Press Office and asked if the garda was facing any sanctions and what protocols are put in place by garda management in instances where gardaí are arrested for drink-driving offences. Not relating to this specific case, a garda spokesman outlined the processes put in place when a member is arrested on suspicion of drink driving. Email “Garda arrested on suspicion of drink-driving after he was spotted driving erratically with burst tyre”. Feedback on “Garda arrested on suspicion of drink-driving after he was spotted driving erratically with burst tyre”.